Dutchman Row and Englewood St. This Commercial retail building has 6,561 sq ft and sits on a lot that is 36,770 sq ft. It is divided into 3 suites and has parking for 66 cars with 2 handicap spaces included. For more information click property information pack in documents. 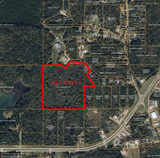 22+/- acres of vacant commercial land. Good location near restaurants, banks and hotels. Fronts Barnes Crossing Rd. Access to US 45. Call 800-473-2292 for more information. 20+/- acres of vacant commercial land located adjacent to Wal-Mart Supercenter on N. Foster Street. Mr. Johnson is retiring from farming. Opportunity to buy farm equipment for your operation.